This was a weekend of family culinary tradition. I’ve written about our tradition of making Pizza Rustica, the incredible meat pie that some Italians bake to celebrate Easter. I even made a video about it. I’ve always loved these meat pies. Cheese, meats, pastry crust… what’s not to love? I also love the recent tradition of the whole family getting together to make 20 or so pies as we did this past weekend. This post is about another family recipe from my childhood. One that started out as something I despised. Another dish that was made around Easter time was simply known as “Nanna’s Calzone”. Growing up, I didn’t know many families that made this. It wasn’t very popular outside of my family. A few years ago I did some research and I found out it goes by many names depending on the town in Italy where you are from. The most accepted name for this is: “Calzone di Cipolla Alla Pugliese” (or “Puglian Onion Pie”). My maternal grandmother’s family is from a region outside of Bari, a port town on the Adriatic Sea. I found out that it’s made mostly in that area of Italy. The dish did not play well with my early childhood taste buds. It’s a salty / savory concoction of olives, onions and most of all, anchovy. Not only did it taste horrible to a young, unexperienced little Long Island kid, I also dreaded the day that my parents would make it. The house would stink like onions, everyone’s eyes would be tearing, and all of this work was all for this fishy tasting, salty pie. It was all sacrifice and no reward! Well, they say your taste buds change every 7 years. I revisited this pie 15 or so years ago and thought it was pretty amazing, but for reasons I don’t understand, our family hadn’t made it in years. I started searching for it online, and decided that I was going to try to recreate it this year, and surprise my family. This past Friday, I was visiting my parents’ house, and I noticed cans of olives and tins of anchovies on the kitchen counter. Great minds think alike, I guess, because my mother also decided to make the pie this year. As a result, this past weekend we got to have a “calzone contest” at Palm Sunday dinner. My mother made the traditional version that I (and she) grew up with, while I updated the recipe and made it my own. The winners were the entire family who got to eat lots of calzone. Here is the recipe for something that started out for me as a most dreaded family culinary tradition, but quickly became one of my favorites. It’s my version of Nanna’s Calzone…. or Calzone di Cipolla Alla Pugliese. Put all of the dough ingredients together in a stand mixer. Mix on low until it becomes a smooth ball. OR, if you are old school… screw the stand mixer and knead by hand until smooth. Separate the dough in to two equal balls. Roll each ball out to a circle that will fill a 8-9 inch pie pan, making a top and bottom for your calzone. Drop a bit of olive oil in the pie pan and distribute with your fingers so the pan is coated. Slowly sauté until the onions are soft and well reduced, but NOT caramelized. Add the chopped olives and anchovies, stirring to combine for 1 minute, then remove from heat. Fill the pie pan that has the crust lining the bottom. 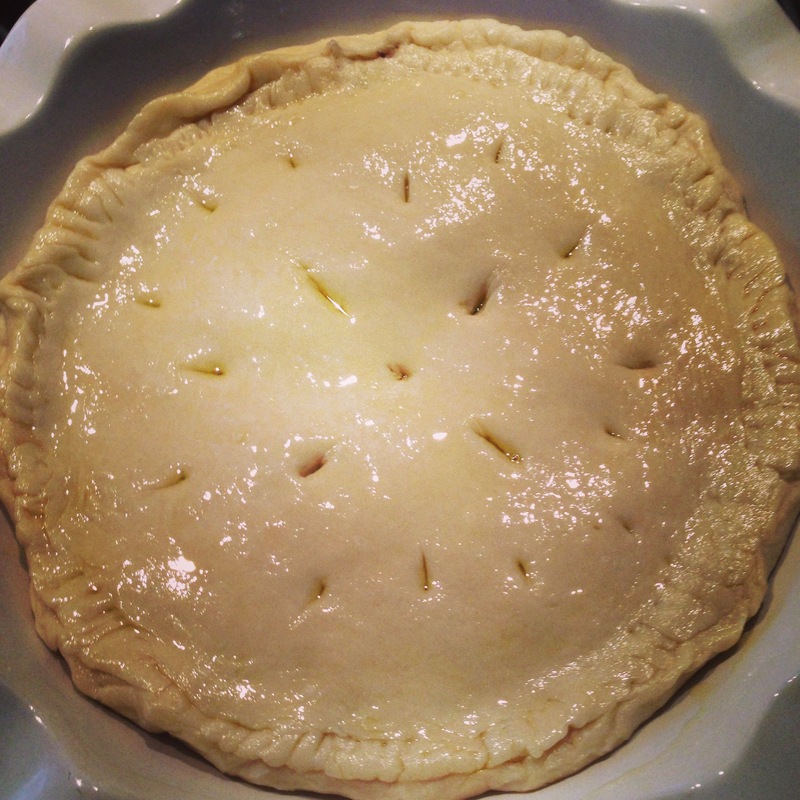 Use the second layer of dough to cover the pie, pressing around the edges to seal the filling inside. Make sure that it’s well sealed. Cook in the 400 degree oven for 30-40 minutes or until the top gets golden brown. Let the pie cool. Serve at room temperature. Personally, I like this pie after it’s been refrigerated overnight, and then let to come to room temperature. I was also introduced to this dish as a young child, and like you would not go near it. As I got older and started enjoying onions, tasted joy when I had this calzone. My mom uses a lot of pepper in it, and instead of kalamata olives my family uses cured olives. My family is from Bari. and my girlfriend’s family also, so she knows this dish very well. It’s a lot of work so it doesn’t get made often. Luckily enough, when this calzone is made so are a few trays of foccacia bread. Ah, the joys of being raised in an Italian family where it’s not all spaghetti and meatballs. Thanks for the comment, Jamie. Always good to hear from a fellow Baresi! Next time I make this, I’m going to have to make extra dough for foccacia. My 4 year old son is a foccacia fanatic! I live in South Florida, originally from New York. My family are from Bari, Italy.. Corato to be exact. Relatives in New York are prominent caterers. They come to Florida, to my home during the holidays. I always try to serve a menu that pleases the sensitive palates of my food loving family. 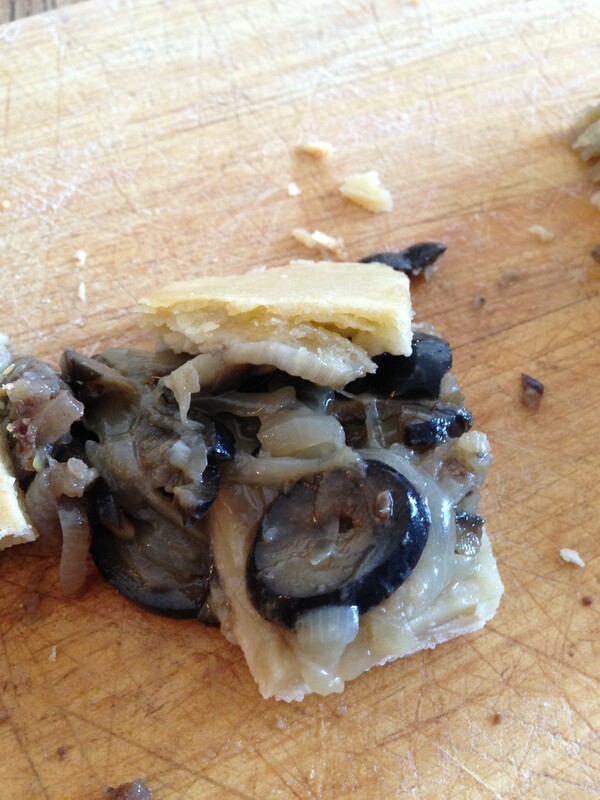 Last year, the onion pie, made with kalamata olives and anchovies, stole the show. What a hit this delicious pie made! I served it as a precursor to the prawns, prime rib and gorgeous lobster tails that graced my table. To this day, they still talk about that wonderful pie of Barese origin. A wonderful joy that will continue to be a Christmas tradition in my home. Denise- Sounds like an amazing meal. I have no idea why we only made this around Easter time, but I think I’m going to make it for Christmas this year. Thanks for reading! We made it tonight …it’s around Christmas and this used to be one of the favorite pies we bought at the St. Joseph ‘ s table each year. Years ago one of the grandmas from Sicily used to make it with tuna!!!!! Awesome! I’ve never heard of this with tuna, but now it sounds like something that I need to try. Merry Christmas! my Family also Brought this recipe from Italy…Taranto. We make it with Pizza dough and 3 to 4″ thick in a roasting pan. We use onions, Sicilian olives and Anchovy and that’s it. its made in our home Christmas eve and also with homemade focaccia and Pizza. Tom, I was just thinking of this for Easter. I too hated it as a child but am craving it now. My grandparents were from Bari also and I remember some kind of a sharp cheese in it too. Can you verify. Also at Christmas they would always made a spiral shaped thin wheel and dipped in a tart fig juice coating called Cattaddata (sic). I have yet to find a recipe for this. Can you help? Thanks for your comment. Sorry it took so long for me to see it. i’ve been traveling overseas, and haven’t had access to my blog. Did you ever find your recipe? The closest thing I’ve heard of to what you are describing are Cucidate. I always called them “Italian Fig Newtons”. If you find something different, let me know. I’m always curious to find out new (old) regional Italian recipes! My Italian mother in law’s family in México call this dish “focaccia” (mistakenly) and they always use whole green onions along with the anchovies and green olives. I have been trying to track its origins to clarify the misconception of the name of this delicious pie recipe and finally I found your site. It is not a focaccia as it is not a flat bread. Their family comes from Rivello, mountanious South being Sapri the closest port city. Wow! That is so interesting. It’s so amazing how foods travel across borders and pick up their own traditions and flavors along the way.